Stanford: "You're not enjoying the revue?" Carrie: "Frankly, I'm more concerned about my own review in the Times." Stanford: "Ohmigod, right, your book's reviewed this week. You must be excited." Carrie: "More like terrified. 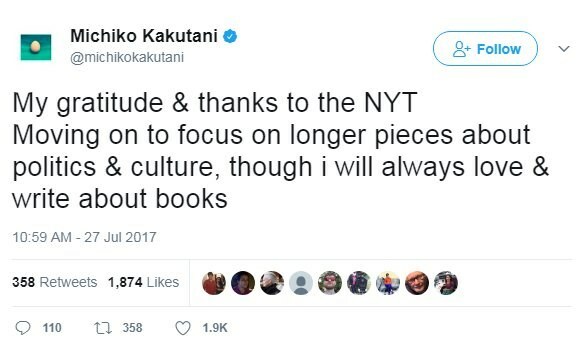 Michiko Kakutani. She's the Times' book critic." Stanford: "Oh, I thought you were suggesting an appetizer." Carrie: "She's brilliant, and she's really tough." Stanford: "And impossible to announce." "...all in all, I enjoyed spending time with Ms. Bradshaw's sharp, funny, finely-drawn world where single women rule, and the men are disposable."